Debarkation Day as President Eisenhower called it. On 5 June 1944, the thousands of ships and craft taking part in Operation NEPTUNE put to sea and began gathering in assembly areas southeast of the Isle of Wight. From there, many passed through the channels swept through the German defensive minefields and moved into their respective waiting areas before dawn on 6 June. Hundreds of antisubmarine escorts and patrol planes protected the flanks of these assault convoys. 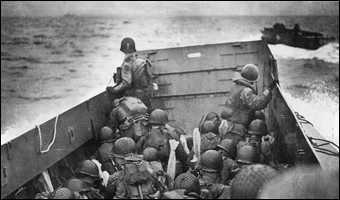 Between 0530 and 0550, the Allied gunfire support task groups began bombarding prearranged targets along the beaches. 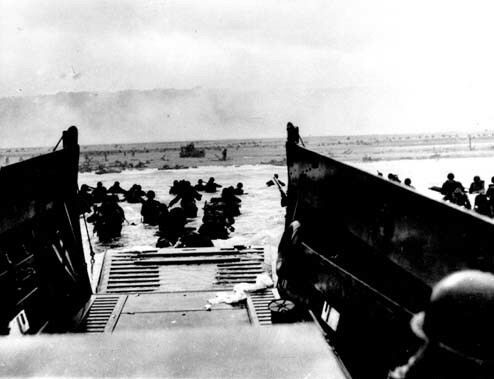 In the American sector, the landing at Utah beach began at 0630 and--despite occurring slightly south of the target area--proceeded according to plan as the U.S. 4th division advanced rapidly toward its initial objectives. 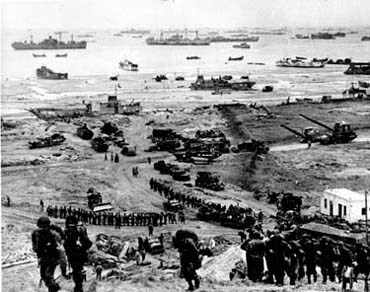 At Omaha beach, where the landings began at 0635, underwater obstacles bottled up many of the amphibious craft and the congestion provided easy targets for German gunners. The landing bogged down and it took a combination of short-range destroyer gunnery support, aerial bombardment and desperate infantry assaults to break the German defenses. 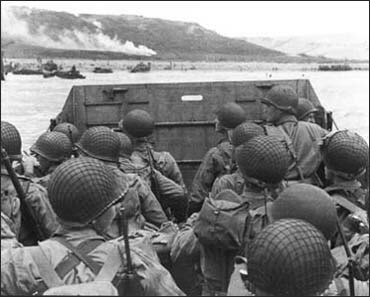 It was not until noon that the U.S. 1st and 29th divisions crossed the beach line in force. The British sector proceeded more smoothly. Despite rougher seas and higher-than-expected tides, which hindered the clearance of beach obstacles, excellent naval gunfire support kept German defensive fire suppressed at Sword and Juno beaches. The landings there, which began at 0730 and 0735 respectively, proceeded apace and the British 3d and Canadian 3d divisions moved inland by early afternoon. At Gold beach, where the 50th division landed at 0725, the beach obstacles were more numerous than expected and many landing craft were lost. This hindered the buildup of forces ashore and it wasn't until nightfall that the beach was secured. The Airbourne Assault into Normandy as part of the D-Day Allied invasion of Europe was the largest use of airborne troops up to that time. 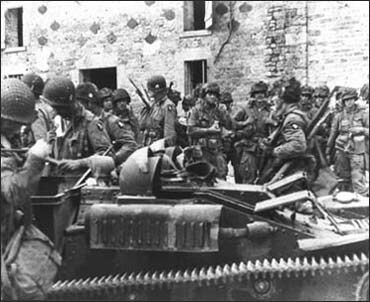 Paratroopers of the U.S. 82nd and 101st Airborne divisions, the British 6th Airborne Division, the 1st Canadian Parachute Battalion, and other attached Allied units took part in the assault. Numbering more than 13,000 men, the paratroopers were flown from bases in southern England to the Cotentin Peninsula in approximately 925 C-47 airplanes. 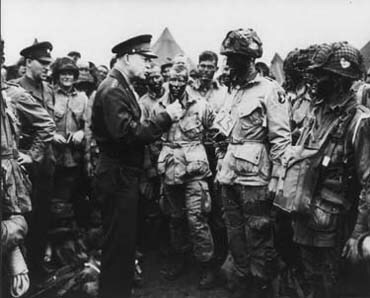 An additional 4,000 men, consisting of glider infantry with supporting weapons and medical and signal units, were to arrive in 500 gliders later on D-Day to reinforce the paratroopers. The parachute troops were assigned what was probably the most difficult task of the initial operation -- a night jump behind enemy lines five hours before the coastal landings.